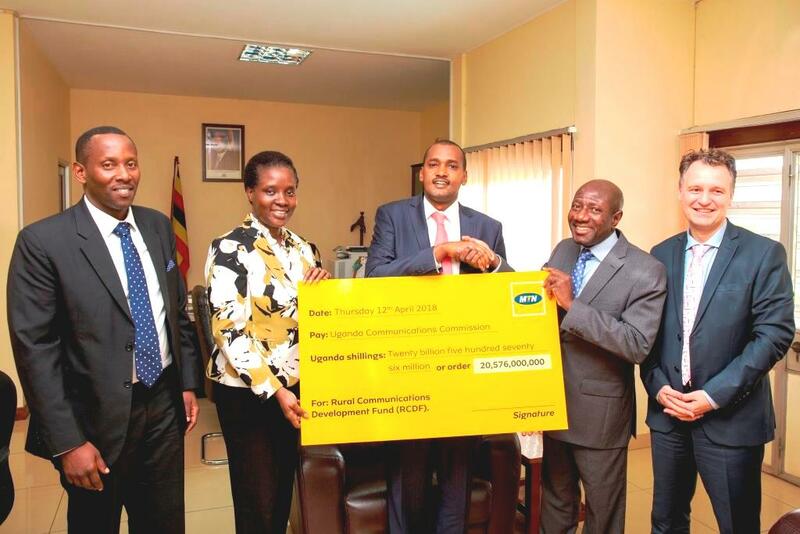 April 16, 2018—Whether by design or coincidence, MTN Uganda has once again shown its financial clout, after handing over a cheque of UGX20 billion (almost $5 million) to the Uganda Communications Commission as its contribution to the Rural Communications Development Fund (RCDF). The telecom is currently waiting for the renewal of its operating license for another 10 years. 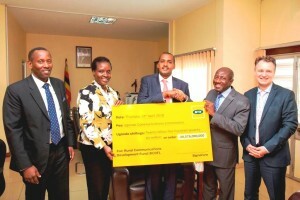 Asante (second right) hands over the dummy cheque to Tumwebaze, as MTN Uganda CEO, Wim Vanhellputte together with corporate affairs manager, Anthony Katamba and UCC’s legal affairs director, Susan Wegoye look on. All telecom firms must pay a 2% levy on their total annual revenues to the Fund which is it is administered at arms’ length by UCC since 2003. The money goes towards extending communications services to disadvantage areas in Uganda. “We are extremely happy with our contribution to the RCDF which has been able to achieve progressive penetration of ICT infrastructure into previously unserved and under-served areas of Uganda,” Ebenezer Asante, the MTN Group Vice President of Southern, East Africa and Ghana (SEAGHA) region said late last week. MTN Uganda’s market share in the country’s mobile subscribers is presently 55%. The RCDF addresses issues of connectivity, access, affordability and equity within the ICT sector and is a fundamental policy being pushed by members of the International Telecommunication Union. UCC retains the roles of oversight and policy over the RCDF. At one point legislators attempted to have the levy paid into the Consolidated Fund which UCC vehemently resisted and won the day. Asante said, “We have been known to be the only telecom operator that always complies and consistently contributes towards the RCDF. Since 2003, MTN Uganda has contributed over UGX121 billion to UCC towards the RCDF. This, in addition to being the top tax payer in Uganda contributing over UGX 3.9 trillion shillings, makes us very proud of our leadership role towards the development of the country and also investing in the ICT sector. “This is in line with our strategic vision of leading the delivery of a bold new digital world to our customers and the markets we operate in,” he said. Asante was on a working visit to Uganda to acquaint himself with MTN Uganda operations and the ICT sector in general. Prior to his appointment as VP of the SEAGHA Region, Asante was the CEO of MTN Ghana and MTN Rwanda.